Finals times are now available on the Broadmeadows website. All the best to teams on Saturday. A number of matches that were scheduled at Oak Park have been moved to Roxburgh Park College (60-70 Donald Cameron Drive Roxburgh Park 3064). At this stage, we believe it only affects our Under 10 boys’ team, the Roos, however please double check your online fixture for this Saturday 1 June. We have been notified that the U12 Girls’ A Grade, U12 Girls’ B Grade, and U16 Girls’ fixtures have been changed. None of the Greenvale teams are affected this week, but please check your fixtures online for all future rounds to ensure you are aware of the latest changes. The online fixtures have already been changed. The grading rounds are complete. The fixtures have been published. The new training schedule is set …. now all there is left to do is shoot some hoops and have some fun. Enjoy! 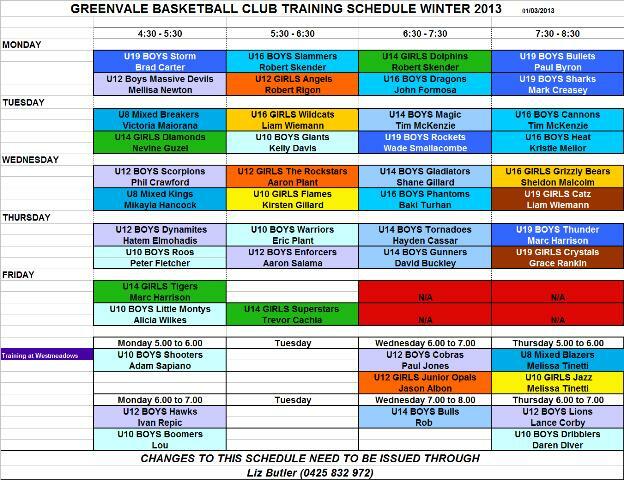 Game times for the first four grading rounds of the Winter 2013 season have now been posted on Broadmeadows website – follow this link for Greenvale team times … all the best for the new season. Reminder that we have no basketball matches this weekend, 9 March …. the Winter 2013 season kicks off with round 1 on Saturday 16 March. Please check with your team manager or coach when your team starts training – and the first round of matches and venues will be available shortly. Remember you can get your news quickly from here – make sure all your team mates have subscribed to this site by entering their email address into the spot on the right hand side of this site, then clicking in the confirmation email that will be sent … and while you’re at it, why not follow us on facebook too! !